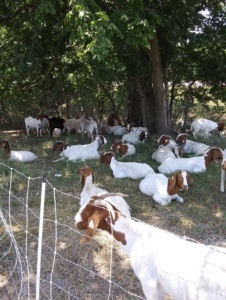 The goats will take a noontime rest from about 11:30 to 2:00 each day to chew their cud (ruminate). They re-chew what they have eaten that morning, to get the particles small enough to pass through to the other chambers of their stomach. You can tell time by the goats when they start to lay down for their siesta.